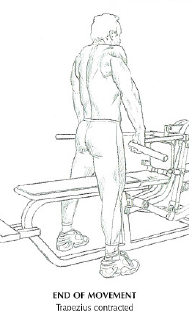 Take the trap bar, paying attention to centering your grip (attention : with heavy weight, a poorly adjusted grip will rock the bar backwards or forwards). You have your head straight or a little bent forwards and your abs squeezed. 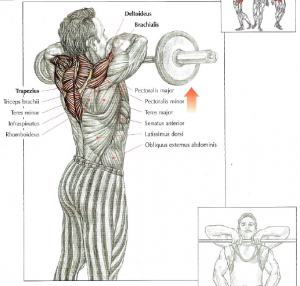 Do shoulder shrugs. 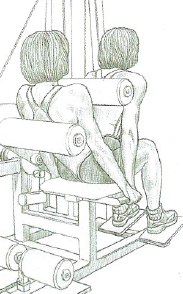 This exercise works the upper trapezius which is inserted on the clavicle, the acromion and the scapular spine and which goes up to the superior nuchal line the the skull. 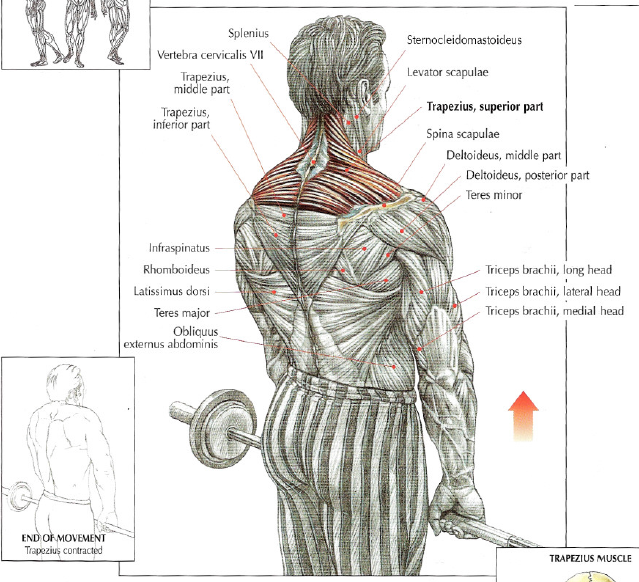 The rhomboid major / minor muscles and levator scapulae muscle work a little bit. 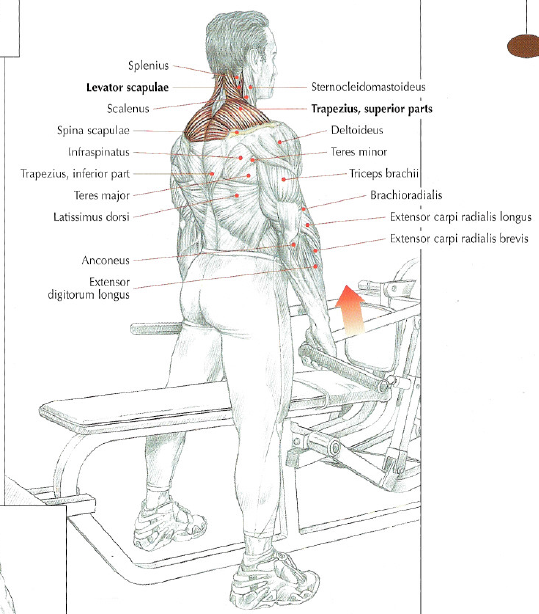 The trap bar created to work trapezius by lifting heavy weights without rubbing against the thighs like dumbbells or barbell. 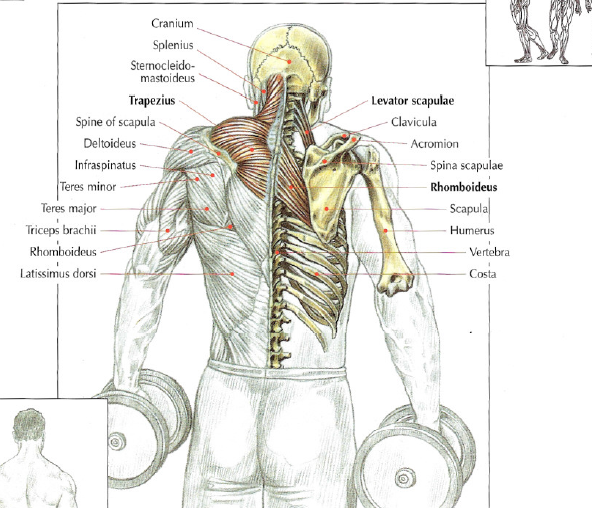 People with long clavicles will always have more difficulty doing shoulder shrugs than people with short clavicles. 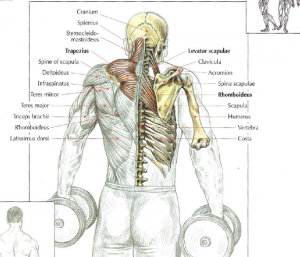 This exercise works the upper trapezius, levator scapulae and rhomboids when you press your scapulae together to shrug your shoulder to the rear. With heavy weights, the shoulder’s rotation becomes impossible. 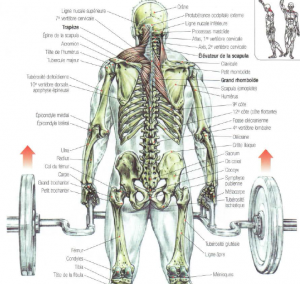 Take the barbell with a pronated grip or a over-under grip if the weight is heavy. The spacing of your hands is your shoulder’s width. 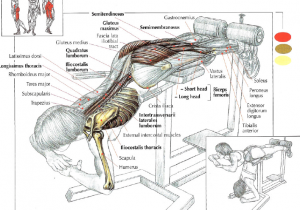 Your arms are relaxed with you back straight and your abs squeezed. Shrug your shoulders. This exercise works the upper trapezius and a little bit deltoids. 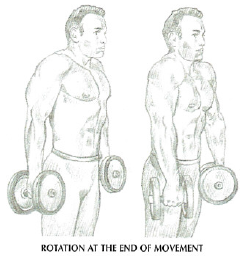 When you lift heavy with a over-under grip, it’s advisable to change the hand grip to each set to balance the trapezius. Do a set with the right hand with a pronated grip and the left hand with a supinated grip and the next set the right hand with a supinated grip and the left hand with a pronated grip. Back to the start position by controlling the movement and exhaling. 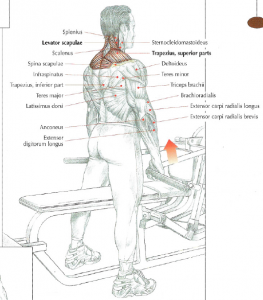 This exercise works spinal erectors muscle mainly, the sacro-lumbar of the spinal muscle and a little bit longissimus thoracis, iliocostalis lumborum, quadratus lumborum. 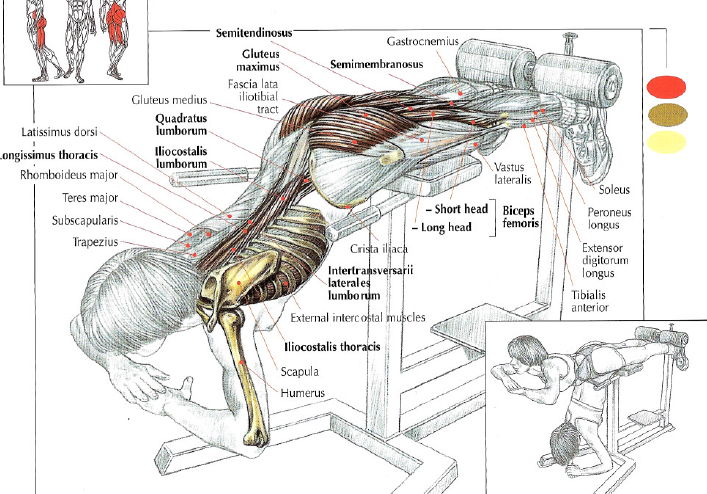 This machine is excellent for beginner to gain strength to do back’s exercise more technical later. 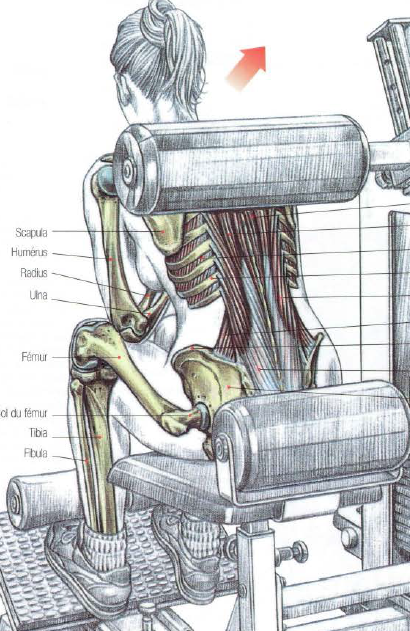 What is interesting with this machine, it’s to change the weight and the movement’s amplitude during session. 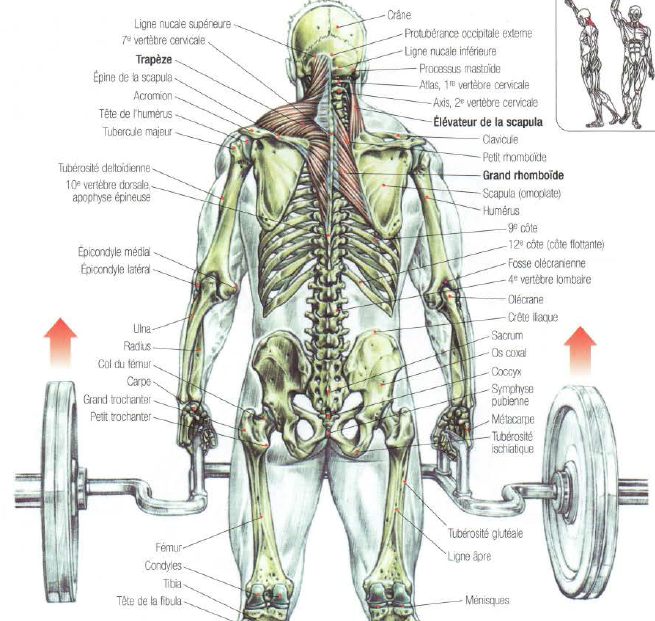 Do 2 sets of 15 reps with a moderate weight and a complete execution of the amplitude and then do 2 sets of 7 reps with a heavier weight and a reduced amplitude.